This unique book is the perfect start-or addition-to any Marvel fan's collection! Using her in-depth knowledge and passion for Super Heroes, Lorraine Cink explores the lives of the exceptional and diverse women of the Marvel Universe. Filled with inspirational lessons and clever observations, each section digs into what these relatable women can teach us all about growth, bravery, and the true meaning of strength. Paired with over one hundred original, vibrant, and emotive illustrations from the talented Alice X. Zhang, this book balances the responsibility and the fun that comes with being a hero. 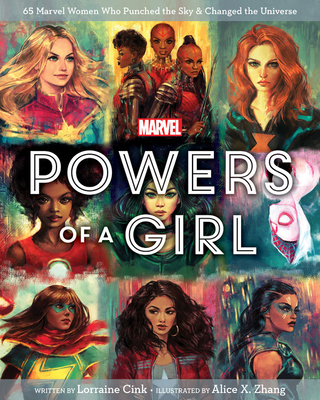 Featuring popular characters including Captain Marvel, Black Widow, Shuri, Okoye, Squirrel Girl, and more, this book has something for everyone. Lorraine Cink is an actor, improviser, writer, director and host. She is native to Bakersfield, Calif. (where oil used to come from). Lorraine is a graduate from the acting programs at the Pacific Conservatory of Performing Arts, Philadelphia University of the Arts and The Peoples Improv Theater as well as training at UCB, the Magnet and Second City. Currently, she is the host and writer of The Marvel Minute and THWIP! The Big Marvel Show, an online geeky variety program for Marvel Comics. As well as releasing videos on her personal channel youtube.com/lorrainecink. She performs live in NYC with the PIT house musical improv team Hello every Friday night, as well as on the Magnet musical house team Legend, and the PIT improv team Hero Complex. Lorraine, when not performing, is a published author and playwright. The first book that she co-authored was Marvel Absolutely Everything You Need to Know and also penned the play "Emilia's Wish" with Milk Can Theatre Co. which was nominated for an Innovative Theatre Award for Outstanding Short Script. Lorraine is the proud owner of a dog named Robot for whom she is eternally thankful. Alice X. Zhang (also known as AliceXZ) is a Chinese-American illustrator with an enduring interest in cinema, comics, and pop culture. She holds a BFA from the Rhode Island School of Design, and, after quitting a job at a t-shirt design company, began a full-time freelance illustration career, gaining popularity online for her expressive, emotive portraits and bold color choices. In addition to two solo gallery shows, her clients throughout the years have included Marvel, BBC Worldwide (Doctor Who, Sherlock), DC Films, and Lucasfilm (Star Wars). She balances her busy work life by playing video games and spending time with her GSD dog Salem.